One and two bottom plows with 14" bottom provides excellent soil tillage for small and hobby farmers. The shear - bolt protection to protect the unit from underground objects. One row 3-point middle buster is designed for the farmer or gardener. The Tool bar is constructed from heavy welded angle iron uses a steel shank with a 14" replaceable point. 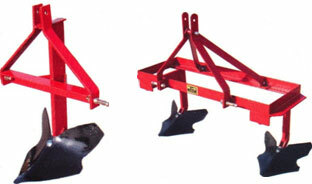 The two row middle buster uses two replaceable 14" points with row spacing at 36",38",40" and 42". 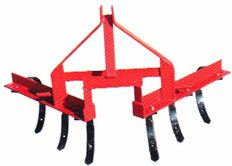 The 3 point one row cultivator has been durability in mind. Equipped with six-springs¬-tines with 2" reversible and replaceable heat treated points. Adjustable tine spacing for cultivating row crops.